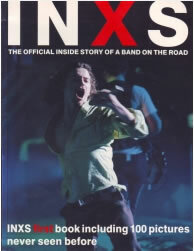 The first official book about INXS, to coincide with their X tour and studio album. The book includes: band profiles; a complete discography and videography; on-the-road hotel and travel anecdotes; continent-by-continent itinerary; plus 60 color and 40 black-and-white photos. The book is magazine size. Second hand book in good condition.